Jax Jolene went home with Andy, Amy, Bailey and Chloe tonight in West Chester. Mia the little dog and one of their 3 cats were in the family photo, Ariel, Bella and Oreo all did well meeting Jolene. Mia was happy to have a friend, but I think a little leary of the muzzle and how tall Jolene was. But in time they'll become good friends. Jolene investigated the entire house even went right up their steps, she knew she was HOME. She now has a HUGE yard to stretch those legs and several new toys and a family that will give her the love and attention she deserves! Jolene's birthday is Oct 24th and her family told me tonight they were going to give her a PARTY! 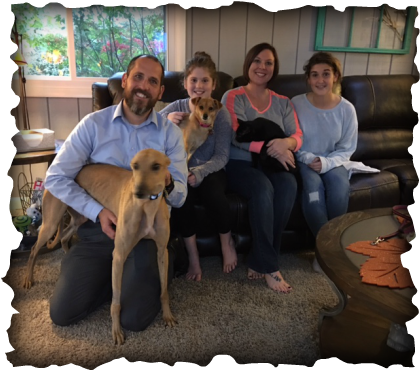 We really hope to see this family get involved with our organization, they fell in love with greyhounds very quickly!